"One night, during a bad snowstorm in Boston, [player-coach Bill] Russell wasn't able to get to the game. So Red was the substitute coach that night. "Early in the game I missed a few shots in a row that I normally expect to make. My head was kind of hangin' a little bit. "So I went out and started callin' for the ball; I thought I had a hot hand. "He was a master at handling people -- a master psychologist." Time and again you hear Celtics describing Red as "a player's coach." To the world outside his own huddles and locker room he was ornery and miserable, a boisterous dynamo who peered at you through cigar smoke after his troops had impaled yours. But not with his own players. He supported them. He had their backs. They knew it, so they did everything to please him. He emphasized people far more than X's and O's. 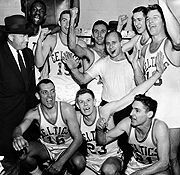 "Red Auerbach convinced his players that he loved them," said Earl Lloyd, the NBA's first African-American player. "So all they wanted to do was please him." It was the best way of getting the maximum from his squad. He did it to squeeze even the slightest of advantages from situations. Sure, he could be the consummate actor on the sidelines -- waving his arms, stomping his feet, tearing at his hair. He received more fines and was thrown out of more games than any other NBA coach. He was even tossed out while coaching the All-Star Game in San Francisco's Cow Palace in 1967, Rick Barry recalled with a laugh. What does Lloyd remember most about Auerbach's teams? "That they won more than anybody else," he laughs. "That about sums it up." 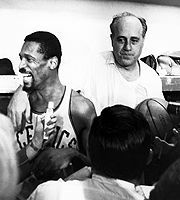 Before Auerbach's nine championships in 10 years (1957-66), before the signature victory cigar on the bench that signaled the enemy was somewhere between simmering and cooked, before Celtic mystique and the parquet floors, there was Brooklyn. Arnold Jacob Auerbach was born on Sept. 20, 1917, the son of Marie Thompson and Hyman Auerbach, a Russian immigrant. Red grew up in the familiar and hardscrabble Brooklyn neighborhood called Williamsburg, where his father ran a dry cleaners. Red helped out with some of the pressing duties and also earned nickels washing taxi cabs. He was a teenager during the Depression, when unemployment in New York rose as high as 50 percent. "I appreciated the fact that my father was a hard-working man," Red once recalled, explaining his father's influence. "Also that he was well liked." Auerbach gravitated to basketball because that's what he had. "In my area of Brooklyn there was no football, no baseball," he said. "They were too expensive. They didn't have the practice fields. We played basketball and handball and some softball in the street." Red, who stood 5-foot-9, went to Eastern District High School and began courting basketball. As a senior, he made all-Brooklyn, second team. After Seth Low Junior College (part of Columbia University) closed in Brooklyn during his freshman year, he transferred to George Washington University in Washington, D.C. It was there at GW, under coach Bill Reinhart, that he learned the running game that would later become a Celtics trademark. With Reinhart's recommendation, Auerbach landed a position as basketball director at prestigious St. Albans Prep in suburban Washington. Coaching, not playing, was his future. He married Dorothy Lewis in the spring of 1941. He also got his master's degree and joined the faculty at Roosevelt High School in Washington, teaching history, health and physical education. An article that he wrote on indoor obstacle courses for the Journal of Health and Physical Education was the beginning of a publishing career that eventually included five basketball books, translated into a half-dozen languages. To make extra money, he refereed basketball games. In 1943 he enlisted in the Navy. By the time Auerbach was discharged in 1946, Walter Brown had helped start the Basketball Association of America. Mike Uline, owner of the Washington Caps, wanted to hire Auerbach as coach. But Auerbach was married and soon to start a family, so the move was risky for him. "I had a permanent job already, but I felt I could always get a job if it didn't work out," he recalled. He took the job, filling a roster with the names of players he remembered from his days in the Navy. Red was only 29. "Some of the guys on the team were older than me," he said. "I just sold the guy a bill of goods to get the job. A lot of guys had better credentials." He paid no one on the team more than $8,500 and insisted on defense and conditioning from his players. In the 1946-47 season, his team finished 49-11. After three years of coaching the Washington Capitols and the Tri-Cities Blackhawks of Iowa in the BAA, and winning 143 of 225 games, he was hired by Brown to coach the NBA's Boston Celtics. Brown was in debt and looking for a head coach for one last go-around with Boston. Fortunately, Auerbach had Bob Cousy during his first year at the helm, helping him turn the Celtics from a 22-46 team in 1949 into a 39-30 team in 1950. Cousy was good right out of the box, scoring 15.6 points and averaging nearly five assists a game in his rookie year. But Auerbach almost didn't get him. Auerbach wasn't short on opinions about who should play on his team. "Am I supposed to win here, or take care of local yokels?" he asked, suggesting that Cousy was touted merely because he played at nearby Holy Cross. Auerbach passed on Cousy in the draft, instead selecting 6-11 center Charlie Share. Local fans were irate. Due to outrageous fortune -- several teams had folded -- Brown offered Cousy $9,000 a year. He signed. Had Cousy taken umbrage at Auerbach's "local yokel" remark and not signed, things might have turned out very differently. Celtic luck may have been born right there. Besides Cousy, the Celtics had a 20-point scorer in Ed Macauley. "We had a good team, but we would get tired in the end and couldn't get the ball," Red recalled. A big man was sorely lacking. "We were good, but hadn't won yet," Cousy said. "But I remember one day in 1956, Red said, 'I think I'm getting a guy that will change things.'" To get Bill Russell required some legendary maneuvering that would take its place in Celtics lore. 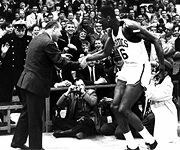 Rochester was drafting first, with St. Louis second, and the whole world knew about Russell's exploits at the 1956 Olympics in Melbourne, Australia, and at the University of San Francisco, where his team won 55 straight. Rochester was strong up front and looked to draft Sihugo Green. Brown gave Rochester team manager Les Harrison additional incentive to avoid Russell. If Harrison passed on Russell, Brown would arrange for Rochester to get the touring Ice Capades two weeks later. Recalled Auerbach: "Walter got him the Ice Capades, and Harrison said, 'I give you my word that we'll stay away from Russell.'" But all this would have been for naught if St. Louis had picked Russell second. Auerbach called Ben Kerner to see if he would make a deal. Auerbach offered All-Star Macauley. Kerner badly needed stars to keep his franchise afloat, so he asked for Cliff Hagan, too. Auerbach agreed. With Russell in the pivot, the Celtics had a spider-armed, tireless intimidator. He had run track in college and could outrun everyone on the team. "Russell could change a game without scoring," says Don Nelson, a teammate of Russell's in the 1960s. Cousy recalled how Russell would deliberately goal-tend a few shots at the outset of the game -- just to intimidate the other team. He also recalls that Russell's fury on the court was owed in part to the racial slurs he endured. "What made him special was his fantastic reactions," Red remembered. "He was a brilliant guy; you couldn't fool him twice. He had long arms. He was interested in defense. Most big men were interested in scoring. Russell was the opposite; he'd let the other guys shoot the ball." In his first year, Russell led the team in rebounding. 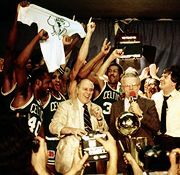 Behind rookie Tommy Heinsohn's 37 points, the Celtics won their first world championship that year, winning Game 7 in an agonizing three overtimes, 125-123. In 1958, Russell injured his ankle in the Finals against St. Louis and the Hawks won in six games. It was the last time any team other than Boston would win the title for eight straight years. Former NBA coach Hubie Brown remembered what worked so well: "[Red] had a relentless fast break, pressure defense and Bill Russell in the back that allowed him to play this style. They were also very organized in their play sets. Then, I feel he had the ability to motivate them individually, because it is extremely difficult to maintain excellence. It comes down to that ability to maintain excellence. He knew how to push the right button on each guy to get him to be subservient to the team." Through it all, Red typically ate Chinese food in his room between games, conserving his energy for the grueling travel demands that included more trains and cars than planes. The 1960-61 squad may have been the Celtics' finest under Auerbach. The team went 57-22 and, amazingly, had six scorers averaging between 15 and 21 points a game without one finishing in the top 10. As Brown observed, under Auerbach, the Celtics understood the maxim "There is no 'I' in team." "In any good coach is the ability to communicate," Auerbach explained. "In other words, a lot of coaches know their X's and O's, but the players must absorb it. Team was important. We didn't care who the starting five was. The sixth-man concept was my idea." Frank Ramsey and John Havlicek were the first two players to perform in that role. Auerbach could be a taskmaster in practice. Sure, the Celtics were knee-deep in talent, but they also worked harder than other teams. "Defense and conditioning were the best parts of those teams," says former Celtic Tom "Satch" Sanders. "In those days you had eight teams, 10 guys, 80 players altogether," Brown said. "Nobody had a two-year contract. Everybody played year-to-year." Boston took on all comers, but Los Angeles in particular was victimized more than the rest. In the 1960s, the Lakers never quite had enough to get them over the top. Six different times in the playoffs (1962, 1963, 1965, 1966, 1968, and 1969) the Lakers ran out of gas against Boston. Three of those series went the full seven games. As the Celtics' routinely whipped the opposition, Red would frequently sit back and enjoy the end of the game -- with a cigar. Hence, the "victory cigar." "It all boils down to this," Auerbach said. "I used to hate these college coaches or any coach that was 25 points ahead with three minutes left to go, and they're up pacing and they're yelling and coaching because they're on TV, and they want their picture on, and they get recognition. To me, the game was over. The day's work is done. Worry about the next game. "So I would light a cigar and sit on the bench and just watch it. The game was over, for all intents and purposes. I didn't want to rub anything in or show anybody what a great coach I was when I was 25 points ahead. Why? I gotta win by 30? What the hell difference does it make? "The commissioner [Maurice Podoloff] said you can't smoke the cigars on the bench. But there were guys smoking cigarettes on the bench. I said, 'What is this, an airplane -- you can smoke cigarettes but not cigars?' No way. I wouldn't do it." Sanders didn't mind the smoke on the bench, "but the locker room was another story; it was close quarters in there!" Would Red put out his cigar? "Are you kidding?" Sanders snaps. "I smoked all different cigars at that time," Auerbach says. "Sometimes fans would give me some. I did TV promotions for King Edwards." 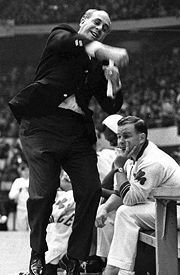 On April 28, 1966, Auerbach, who earlier in the season had announced he'd be retiring, coached his last official game. Appropriately, it was a Game 7, at Boston Garden, against Los Angeles. Russell had 25 points and 32 rebounds, enough to offset Jerry West's 36 points, and the Celtics narrowly won, 95-93. Red's victory cigar was knocked from his mouth by the surging crowd. He lit up another in the dressing room and Russell pointed to Auerbach, saying, "There is the man. This is his team. He puts it together. He makes us win." 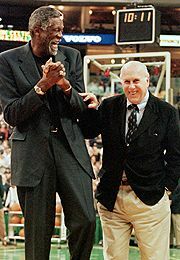 The Celtics had copped nine world championships in the Auerbach era, and he retired with a record 938 wins. After Russell's 11th title and retirement in 1969, word around the league was that Red had won with Russell, but wouldn't without him. Hubie Brown is unimpressed with that view. "He had Russell, and he won. You think about this," Brown said. "Wilt Chamberlain, Jerry West and Elgin Baylor never won. That's the answer to that. Go up to when Red retired [when he appointed Russell as player-coach]. Elgin Baylor, Bob Pettit, Oscar Robertson, West and Chamberlain were the best all-time at that point. Los Angeles got three of them and couldn't win." And win again, Red would. 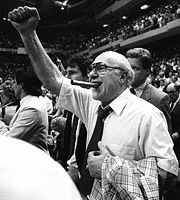 With Havlicek, Jo Jo White and Dave Cowens leading the way, the Celtics, with Auerbach as general manager, won two world championships in the 1970s -- the only team besides New York to accomplish that feat. However, after Havlicek departed in 1978, the Celtics went through lean times again. In two years, the Celtics won 61 games and lost 103. So Auerbach went to work on a player from Indiana State named Larry Bird. 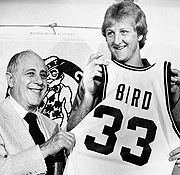 Five teams had passed on drafting Bird in the first round in his junior year. "They didn't know he'd be that good, and I didn't either," Auerbach said. "I only saw him play once." But Auerbach didn't pass on him. Picking sixth, he thought Bird would be impressed with the Celtics' history and mystique and would eventually sign without re-entering the draft. It is due to this kind of maneuvering that Auerbach is often regarded as the greatest NBA executive of all time, in addition to his coaching achievements. He scouted talent, recognized it, saw how it would aid his team and signed the player. The Celtics won only 29 games in the 1978-1979 season but leapt to 61 wins the following year with Bird, who averaged 21 points and 10 rebounds a game. In Bird's second year, the Celtics took their 14th NBA title, first knocking off Julius Erving's 76ers and then Moses Malone's Rockets. Two more titles in 1984 and 1986 ran Red's total to 16. Auerbach's singular managerial greatness was again evidenced in 1986. He was plotting the future, even while the Celtics had become what Bird called "the best team I ever played with." Red had been following the fortunes of the Seattle SuperSonics. In the previous two years they had won only 31 games, and Red knew he could trade a respectable player for a draft pick or two. He gave up Gerald Henderson to acquire Seattle's first-round pick, which turned out to be the second pick in the draft. He snapped up a most unusual athlete. In Maryland's Len Bias, Auerbach acquired the size of a young Karl Malone and the ball handling and perimeter shooting skills of a guard in one package. When Bias came to Boston for a visit, he said to Celtics executive vice president Jan Volk, "Please draft me." As commissioner David Stern announced the selection of Bias on national television, the young man beamed and wore a Celtics hat to the podium. Hours later he would be dead of a cocaine overdose. "I was shocked," Red recalled, saying no more. "It's the cruelest thing I ever heard," Bird added. Beginning with Bias' death and then the early retirements of Kevin McHale and Bird and the sudden death of Reggie Lewis in the summer of 1993, Boston endured a most un-Celtic-like string of bad luck. Now no one dared to speak about the lucky leprechauns who slept beneath the floorboards to tilt the game. Forget Irish fable. The Celtics set off on a Greek tragedy, as if paying off a debt for all their hubris and good fortune. Had Bias lived, his presence might well have extended the careers of Bird and McHale and would have given Boston a good shot at another title or two in the late 1980s. Now, it's been almost 20 years since the team won it all. By the early 1990s, Red was not as active in the day-to-day operations as he once was. "I don't have the desire and the say anymore," once Red told me in a Chinese restaurant, surrounded by shrimp and lobster sauce, fried rice and a platter of fish and beef goodies. "In other words, I can't see myself getting on the phone three and four hours a day and calling this owner and wheeling and dealing. I don't want to do that. To make a deal, you gotta be on the phone all the time." Even while recovering from heart surgery, Red explained that he still enjoyed racquetball and his favorite Nicaraguan Hoyo de Monterrey cigars -- two a day. At Legal Sea Foods restaurant in Boston, a note on the menu read: "No cigar or pipe smoking, except for Red Auerbach." Despite retreating from the basketball scene, Red could still fire off in-your-face opinions. In June he told me, in earnest, that a "Dream Team" made up of players from the late 1940s to mid-'70s could beat a new dream team. "If I was starting a team, I would take Russell," he said. Auerbach's loyalty to his own players, who emerged victorious in 16 NBA seasons, is understandable, and it went both ways. He once told the story about his 75th birthday party, when about 45 of his players showed up from all over the country. "When you treat people good, they will want to reciprocate," Red said. "We're the only team with alumni like that. We're a real group." Then he continued picking his team. "If I was picking 12 all-time guys, I would include Russell, [Kareem] Abdul-Jabbar, Chamberlain, Bird, Baylor, Pettit, Dr. J [Erving], Magic [Earvin Johnson], Michael Jordan, Oscar [Robertson], Cousy and Havlicek. You can make a case for about five or six guys being the greatest of all time: Bird, Johnson, Abdul-Jabbar, Jordan, Russell, Oscar." But since his 30-year team (dividing the 59-year history of the game in half) would include Russell, Pettit, Baylor, Robertson and West -- with Abdul-Jabbar, Chamberlain, Havlicek, Cousy and Erving off the bench -- it's hard to argue that the newer guys would run away with it. But who would guard Jordan, I asked. "We'd wear him down with Havlicek and West," Red insisted, noting the need for two fresh defenders. "Besides, who would outrebound our front line of Chamberlain and Russell and Pettit? We would get a load of offensive rebounds and control our defensive boards." There he was, full throttle into this contest of his own conjuring. He was envisioning the competition in his mind, perhaps seeing it played out on some distant court. You could see him coaching his dream team, see him imploring Russell to get a defensive stop, encouraging Chamberlain to take care of the defensive boards, shouting at Mendy Rudolph to let the contact go on Jordan. Who would be better for the task? Who could get more out of his team? Who better to work for an edge, to milk every advantage right to the end? Ken Shouler is the editor and a writer for "Total Basketball: The Ultimate Basketball Encyclopedia."